NEW DELHI — At least 28 people, many of them agricultural workers in fields, were killed by lightning when storms lashed southern and eastern India, officials said on Monday. The southern state of Andhra Pradesh was the hardest hit by the storms on Sunday, with 19 deaths across six districts, said J. V. Ramudu, a senior police official there. “The number of lives lost seems to be very high compared to previous storms,” said M. Sanjay, another senior police official in the state. Female cricket players in the Guntur district of Andhra Pradesh fled a field where they were competing when lightning struck a nearby palm tree, engulfing it in flames, Mr. Sanjay said. 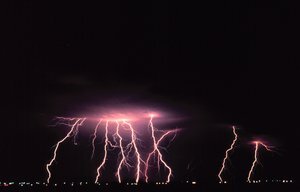 Eight people were killed by lightning in the eastern state of Odisha, and one died in the southern state of Telangana, officials said. Lightning killed more than 2,500 people in India in 2014, according to the National Crime Records Bureau. Sunil Pawar, a scientist at the Indian Institute of Tropical Meteorology in Maharashtra State who studies lightning patterns, said that Sunday’s death toll in Andhra Pradesh was the highest he had heard of from a storm on a single day. N. Chandrababu Naidu, Andhra Pradesh’s chief minister, announced 400,000 rupees, or about $6,000, in compensation for the families of the victims, the Press Trust of India reported. Though Mr. Pawar said that most lightning casualties happen during the monsoon season, which stretches from June to late September in some parts of the country, most deaths occur at the beginning and end of the monsoons, when the storms have started to weaken and more farmers venture out into the fields.